The RJD, the JD(U) and the Congress had fought the 2015 Bihar Assembly polls together forming a formidable 'mahagathbandhan' (grand alliance) which had defeated the BJP-led NDA in the state surmounting a country-wide wave in favour of Prime Minister Narendra Modi. Patna: The ruling JD(U) today took a swipe at the luncheon meeting between Rahul Gandhi and Tejashwi Yadav and claimed that the Congress vice president in the past was aversed to any show of proximity to RJD supremo Lalu Prasad. 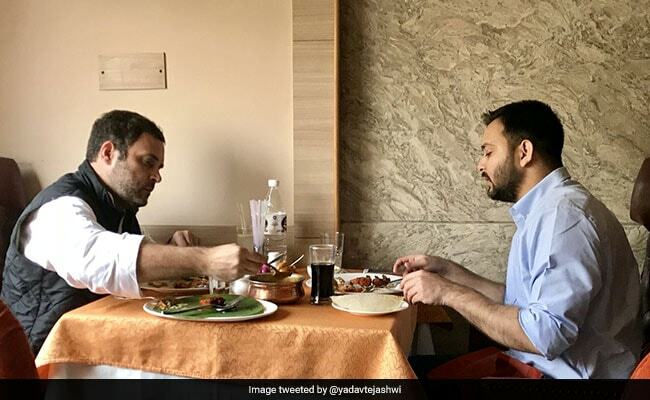 Mr Gandhi and Mr Yadav had met over lunch at a restaurant in Delhi yesterday after which the latter had posted a photograph clicked on the occasion on Twitter, thanking the Congress vice president and saying he felt "appreciated" and "grateful". "It seems a new relationship is being built between Bofors and 'Chara' (fodder)", Janata Dal (United) chief spokesman Sanjay Singh said in an obvious dig at the scams in which the names of top leaders of the Congress and the Rashtriya Janata Dal have figured. Taking potshots at Rahul Gandhi, Mr Singh asked, "He is so conscious of his image that he used to avoid sharing the stage with Lalu Prasad despite the latter being his long-time political ally. Does he see no problem now in hobnobbing with the RJD supremo's son." Meanwhile, RJD national vice president Shivanand Tiwary said "it is indeed the beginning of a new relationship. Both Rahul and Tejashwi have a common political goal which is to defeat the BJP." "We hope misunderstandings, if any, between Rahul and Lalu will be cleared and the Congress vice president will be in direct touch with Tejashwi over issues relating to Bihar," Mr Tiwary added. However, differences between Chief Minister Nitish Kumar and the RJD leadership over the issue of corruption cases involving Tejashwi, who was then his deputy, led to the collapse of the 'grand alliance' in July last. Mr Kumar resigned from his post and was immediately offered support by the BJP, which paved way for his return to the NDA after four years.